After you've (hopefully) earned your chest full of those sweet, sweet credits, here's your first chance to invest them in new machinery. Discounts on mid-tier vehicles, more Crew XP for each victory, and a mission will help you climb the tech trees in no time! 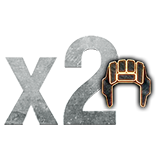 Mission: Earn your XP Booster!